Now that school is out for summer, the Boys and Girls Clubs of America want to help parents and children alike get prepared for Internet Safety Month. Their cyber safety website offers an abundance of information and tools on how to keep kids safe while using the internet. Are you a cyber smart parent? Take this quick 7 question quiz to find out! Is your significant other always misplacing their wallet, keys, phone, etc? With so many things to remember before heading out the door, my husband is forever running late because he can’t remember where he put his everyday essentials. He was in desperate need of simplicity. Enter the Q Card iPhone Wallet Case by CM4, bringing you simplicity and functionality. Offered in 4 unique colors, black, white, pink, and green, this iPhone 4/4S case allows protection for your phone with the combined feature of a wallet. My husband loves Apple products, but was not excited about the sound quality on either the iPhone 4 or iPad 2. We use the sound quite often on the devices for kids games, videos, music, and more. He was seeking something portable, yet packed a mean punch. 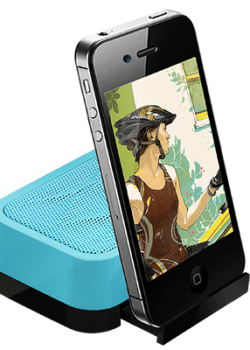 The iFit-1 portable speaker is specially designed for your smart phone with a “smart stand.” It is lightweight, portable and includes a high-quality speaker system, all in compact casing. I don’t know about you, but my family loves to dance. The boys are always asking for “dance time” and they love to shake it. It becomes more like pick me up and swing me around time then dancing, but man it is a workout. Our main method of music lately has been Pandora through my iPad or iPhone, but we constantly encounter the same problem, and that is the speakers on our devices do not get the job done. With little man shouting to the sweet music and our older son singing his own version of the songs it is difficult at times to hear the beat. We all know once our bundle of joy is here we want to show them off to the world. Sometimes it can be frustrating getting that perfect camera shot of baby, especially when we’re sleep deprived! SanDisk, the world’s largest dedicated provider of flash memory storage is devoted to making people’s digital lives better. Check out the video below of some simple tips to taking better baby photos. Photographer, author and educator Erin Manning provides her Top 3 Tips for capturing better baby photos. Erin gives you advice on setting the scene and getting close to the baby for those perfect images, as well as using a SanDisk Ultra SDHC card to make sure she never misses a shot. Disclosure: I participated in a campaign on behalf of Mom Central Consulting for SanDisk. I received a product sample to thank me for participating. 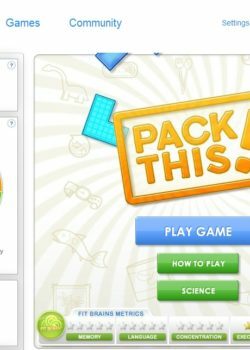 I came across MobileFun.com while researching hands-free solutions for my iPhone. I quickly realized they have a wide range of accessories for any tech enthusiast. You can easily find items by your cell phone manufacturer or network, tablet, kindle, and more. It’s literally your one-stop tech shop! After researching their hands-free devices for cell phones I decided to go with the Motorola T325 Advanced Universal Bluetooth Car Visor Kit. We have teamed up with a great group of bloggers to bring you this fabulous giveaway. One lucky winner will receive a 7” Kindle Fire courtesy of Spend With Pennies! Read on to learn more about the Kindle Fire you might win! If you’re looking for an all-in-one accessory for the iPad, New Trent’s Airbender Keyboard Case does the trick! The Arcadia Airbender Keyboard Case offers a high quality clam shell case with a fingerprint free matte finish, perfect for use by the entire family. 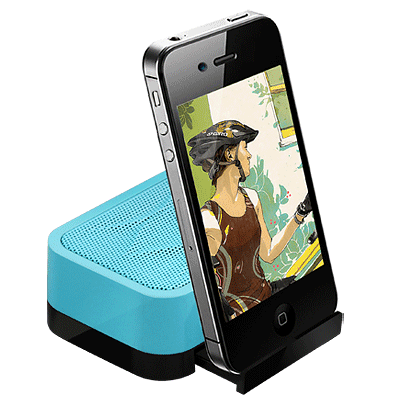 This protective cover is durable while offering a sleek design. It’s really sharp looking! 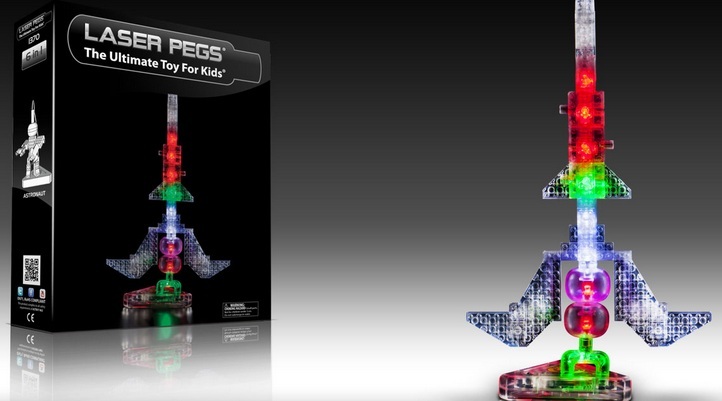 Laser Pegs – An Award Winning Product for Kids! We received the Rocket and Butterfly kits, plus a Laser Peg Pendant for review. This is THE item to buy for the tech lover in your life! As someone who is rarely seen without an iPhone or iPad, the ZAGGsparq 6000 was something I needed. As bloggers continue to rule the social media atmosphere, we’re required to have our gadgets on us at all times. As you all must know by now, my kids are HUGE fans of all things superhero. 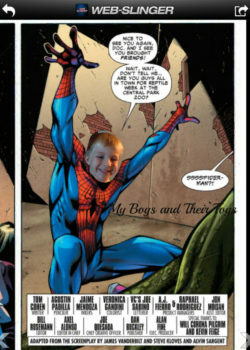 So when we heard The Amazing Spider-Man was coming out on DVD Nov 9th, the kids were ecstatic! 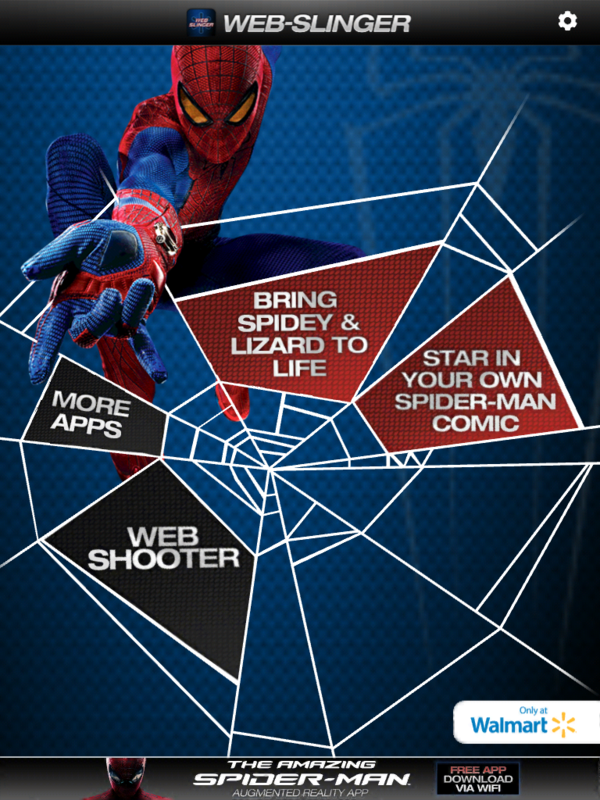 In preparation for the release of the all new Spider-Man movie, we downloaded the Web-Slinger app on the iPad. As Moms we sometimes put ourselves last. I know I’m guilty of that all too often. I recently came across a free app that can be used on the iPhone and iPad by Life…Supplemented called WannaBeWell. The WannaBeWell App is a comprehensive wellness resource that educates, activates, and motivates those who are looking to lead a healthier lifestyle. That’s me! It’s based on three pillars of health at the core of the Life…Supplemented program, Healthy Diet + Supplements +Exercise. The Avengers is coming! The Avengers is coming! This should come as no surprise (seeing as my blog screams Super Hero) that we are so excited for the release of the movie, The Avengers. There’s hardly never a day that goes by without the kids playing with their superhero action figure toys. Baby boy is on an Iron Man kick at the moment and even wants him in the bathroom while we are potty training! Last night we had a blast at our Marvel Avengers themed family fun night . In preparation for the occasion the boys and I headed to the store after downloading the Avengers Augmented Reality App that can be played exclusively at Wal-Mart stores. By using your iPhone/iPad you can find The Avengers App Trigger Points throughout the store and watch how the app interacts with the signage.